Looking for something to slice tomatoes like butter? Try this flexible, scalloped edge knife with a tapered tip. Thanks to superior design and materials, it is just right for peeling, slicing, chopping and carving small meats. It Features a one-piece handle that is injection molded to the tang using Grilon™, a hermetically sealed, fatigue-free, non-slip polyamide. The handle will never deteriorate, is non-porous, and is resistant to high temperatures. A Blended steel blade adds shine, sharpness, and flexibility. This knife will not corrode or stain and is totally dishwasher safe. The Wenger Grand Maitre Multi-Purpose is a super sharp knife that is incredibly easy to use and care for. It is flat heel stamped, and totally manufactured in Delemont, Switzerland using flawless, custom blended European steel manufactured exclusively for Wenger. This same steel has been used to manufacture high end Swibo® knives and Genuine Swiss Army Knives™ for Decades. Get a high quality Swiss Made knife from the company that makes the original Swiss Army Knife. 5.25" blade. For more than 100 years Wenger has specialized in the field of professional butcher knives, kitchen knives, and Genuine Swiss Army Knives. 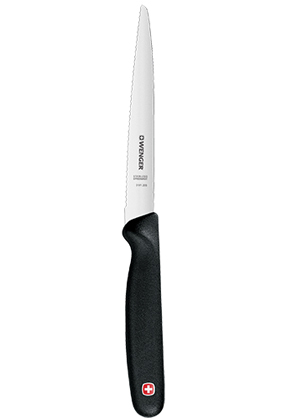 In 1963, Wenger developed a specific range of knives for the butcher and chef, known as SWIBO. Developed with specific requirements in mind, Wenger now offers this line to the consumer under the name Grand Maitre. Good quality knives are an essential part of any kitchen. Whether you are a trained professional or a novice chef, quality sharp knives make cooking safer, faster and more efficient, and are just as important to your meal as the ingredients being used. The Grand Maître line of kitchen knives are still made entirely in Switzerland. The polished, high-carbon, stain-resistant blades are stamped rather than forged, which makes them more affordable yet still extremely sharp. The non-slip, synthetic Grilon handles are injection-molded directly to the tang for increased durability, and are shaped in such a way to reduce fatigue during long stretches of food preparation. With no cracks or seams to harbor bacteria, and because they can be sterilized and washed in a dishwasher, the knives are among those preferred by professional butchers and chefs. Order Yours Today! Uses slicing fruits and vegetables, carving meats, etc. Wenger Grand Maitre Multi-Purpose Knife - High quality materials and superior craftsmanship make this Swiss made kitchen gadget a must have. A great accessory for anyone that enjoys cooking. Have been using this knife for about 40 years. Best one I have ever used. Everyone who cooks should have one or more. I bought these knives as birthday presents for my parents and they love them! We have an older model of the same knife and it is great for everything from slicing bagels to cutting tomatoes. The blade stays sharp after years of use and the handle has a very comfortable grip. SIMPLY THE BEST KNIFE YOU COULD POSSIBLY HAVE IN YOUR KITCHEN. A Dual Mode Sink Sprayer With 3" Extension. Works In Virtually Any Sink! A Sink Mounted Scrubber For Silverware, Knives And Cooking Utensils. Cut Like a Pro! Super Sharp, Triple Blade Design.